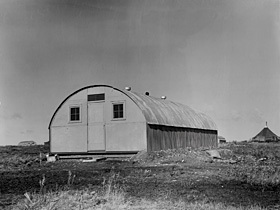 The original, or T-Rib, Quonset hut was modeled closely on the World War I Nissen hut. Both were sixteen feet in diameter and utilized almost identical steel arch frames. The principal difference between the two was in the wall system. In the T-Rib Quonset, the interior wallboards were Masonite®. Its exterior was corrugated metal panels lapped and mounted to wood purlins with a core layer of paper insulation. 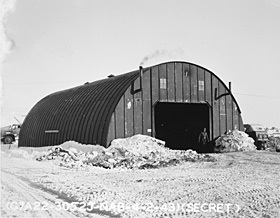 The Nissen hut, on the other hand, had a more complicated system of corrugated metal panels both inside and out and depended solely on the air space between the two for its thermal barrier. T-Rib Quonsets instantly provided U.S. troops with a greater level of comfort than could be provided by tents with wooden platforms typically used at that time. Less than three months after initiating the hut design project, the U.S. military had in its arsenal a new demountable structure that could be shipped in twelve crates and put up in one day by ten men. It required no special skills to erect. 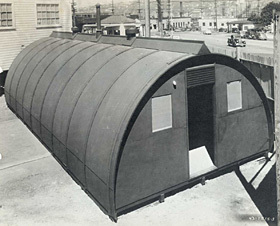 By the end of 1941, approximately 8,200 T-Rib Quonset huts were produced. Huts sent to Iceland proved their success in their first winter of use. According to George A. Fuller Co.: "A night gale of hurricane proportion that wrecked shipping in the harbor, tossed crumpled PBYs on the beach like paper hats, and ripped the covering completely off of many British Nissen huts, left the Quonset huts practically undamaged." 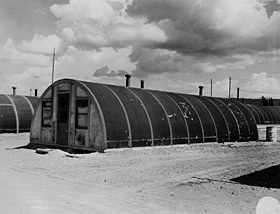 Since the arch of the Quonset hut extended to the floor, beds, sinks, and washing machines had to be moved inward until they abutted the curve at the top edge of the unit. Valuable floor space was being wasted. Reclaiming this space would necessitate changing the overall form of the building. Brandenberger's team proposed a modified arch with four-foot vertical sidewalls. The new arch, assembled in two sections instead of three, reduced erection time and required fewer fasteners. Furthermore, the profile of this arch was changed to a lighter weight "I" section, produced by Stran-Steel--a system that was already being utilized for additions added to T-Rib Quonset huts. The new hut system was thirty-five percent lighter to ship and sixty percent less expensive to produce. 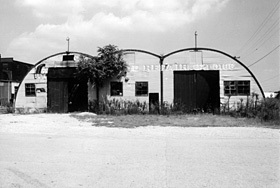 Approximately 25,000 Quonset Redesign huts were produced by George A. Fuller Company at West Davisville, Rhode Island. The last major redesign of the Quonset hut came in about 1943 when the factory at Quonset Point was phased out and the contract to produce Quonset huts transferred to the Stran-Steel Division of the Great Lakes Steel Corporation. The new hut had an expanded footprint of 20' x 48' and reverted back to the full arch rib. Although this was a bigger building than the original 16' x 36' hut, it weighed less and took up less shipping space. The floor system was changed from one-inch floorboards to half-inch plywood, and a lighter gauge galvanized siding was introduced. In addition, the siding layout was modified with the factory-curved panel used only along the ridgeline. The remainder of the hut was sided horizontally, enabling panels to be shipped flat. Stran-Steel also introduced a four-foot overhang at each end of the structure, making the full length 56 feet, but this proved unnecessary in northern climates and was phased out. By the end of WWII, approximately 120,000 Stran-Steel huts had been produced and shipped to almost every corner of the globe. Designed to serve eighty-six official uses- and applied to many more-these huts represented a refinement in thinking that spanned two world wars. When Brandenberger's T-Rib Quonset hut and Quonset Redesign are included in the calculations, there were more than 153,000 lightweight, prefabricated units deployed and erected in support of American troops in WWII. By 1941, companies other than original contractors George A. Fuller and Stran-Steel began developing their own versions of the Quonset hut. Some, like Butler and Cowin, developed Quonset-type structures to sell to the Army or anyone else who wanted to buy them. 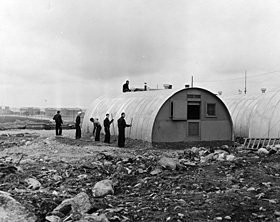 Others created hut designs in response to a special need, such as the wooden Pacific hut, which was created to save metal resources, and the heavy-steel Armco hut, which was intended for ordnance storage and air raid shelters. In addition, Stran-Steel began manufacturing a larger version and a multi-arched version of the Quonset hut. Nicknames abound for various hut types. Some are "official" military nicknames, such as "Elephant Shelter" and "Igloo." After World War II, some companies continued to make metal prefabricated buildings, however, few continued in the old arched shape. The main descendant of the Quonset hut today is the arch-roofed warehouse, now often clad in aluminum, and the tent-like WeatherPort® –– a direct descendant of the Jamesway hut. 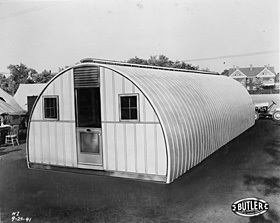 The James Manufacturing Company of Fort Atkinson, Wisconsin, created a version of the Quonset hut with wooden ribs and an insulated fabric covering for the Army Air Corps. This portable and easy-to-assemble hut was designed for arctic weather conditions when personnel were wearing bulky clothes and mittens but needed shelter construction to proceed quickly. Insulated blankets in four-foot-wide lengths were made with glass fiber insulation faced with flame-proof muslin and enclosed in plastic-treated cotton that was water-, vermin-, and fire-proof. The hardware (nails, fasteners, and connecting bars) was the only metal component, and the whole package weighed 1,200 pounds for a 16' x 16' hut. Its wooden packing crates were designed for reuse as the hut floor. The "Portaseal® hut," frequently seen along the Alaska Highway and Canol pipeline, is mostly likely a Canadian version of the wood-framed, plywood-clad Quonset-type structure. These huts were shipped in prefabricated sections, could be erected quickly, and were heated with improvised oil drum stoves. Identifiable features include a tar paper finish nailed atop plywood sidewalls, end walls with large windows, and wide batten-type trim boards atop the end walls' vertical panel joints. Some surviving examples have been observed with six-inch sheathing strips in place of plywood. Frank Hobbs, a mechanical engineer who later formed the Pacific Hut Company in Seattle, took blueprints of his all-wood Quonset design, the "Pacific hut," to the U.S. Army Corps of Engineers in summer of 1942. It was designed to overcome the major shortcoming of the Quonset: its all-steel construction. Steel was not only a critical material during the war, but it also rusted quickly in the tropics and, in the Arctic, permitted cold temperature migration across metal structures. Wood structures greatly reduce thermal transfer. The Pacific hut is easily recognizable by its exterior of celotex, a waterproof form of Masonite®, and by the triangular ridgeline vent cover. 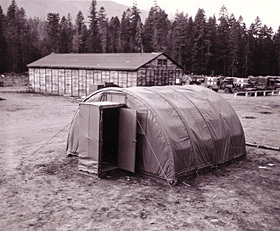 Morrison-Knudsen Company designed the "Emkay" (M-K) hut to shelter their crews for their large and remote military construction contracts. While they credit the origin of the design—inspired by a chicken shed—to their engineer G. D. Paxson, the similarities to the Quonset and Pacific huts are undeniable. Built in Boise, Idaho, beginning in 1943, the Emkay had laminated wood ribs. Its distinct "two-centered arch" appears pointed, or gothic, in profile. All styles were built entirely of wood and wallboard, could be built to any lengths in multiples of twelve feet, and could accommodate different climates. 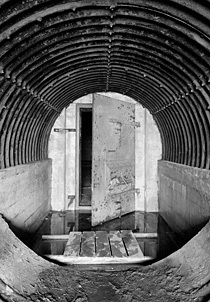 During World War II, the Armco International Corporation of Middletown, Ohio, produced arched corrugated ingot iron bunkers, ammunition magazines, and personnel shelters. The heavy steel buildings were modeled on earth-retaining structures such as culverts and storm sewers. The heavy iron (8- to 14-gauge) did not require supporting ribs but was curved and corrugated much like a Quonset hut." Armcos" were strong enough to be completely buried in up to six feet of dirt. Developed by the Butler Manufacturing Company of Kansas City, Missouri, the "Butler hut" was an all-steel arched hut. With U-shaped arched ribs around an eight-foot radius, its profile was slightly more than a half circle. The endwalls were framed with steel, and both end walls and sidewalls were enclosed with 2' standing seam metal sheets. Not long after World War II, however, Butler abandoned the curved-roof approach, although it still produces metal prefabricated buildings today with gabled roofs. 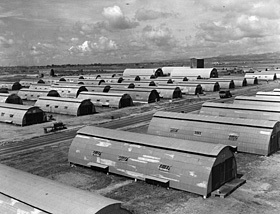 Cowin and Company, Inc. developed large, bloated, semicircular steel warehouses (slightly less than half a circle) for the Air Corps. These 36' x 60' structures were called "Steeldromes." To resist thrust on the arch caused by snow loads, Cowin used a truss system of horizontal steel tie rods and vertical steel hangers. Not many Cowin huts were shipped to Alaska after 1943 because they were inadequate for Alaskan snow loads. A number of them collapsed in their first winter of use. "Utility Building" is a larger version of the Quonset hut. Sometimes nicknamed "elephant hut" (a name also used for Armco Air Raid Shelters), the building evolved over a period of time and could be adapted to tropical climates with the addition with specialized components. A total of 11,800 Utility Buildings were fabricated by the end of World War II. A single unit could be erected by a team of ten men in 300 man hours, weighed only 23,381 pounds, could be shipped in twenty-three crates, and required only 383.17 cubic feet of shipping space. The "Multiple Building" was a hut that could expand in both directions. It used many of the same parts designed for the Utility Building, but it accomplished larger spans by introducing a rectilinear steel frame upon which arched roof segments were joined one to the other with low, sloping valley gutters. The design allowed for expansion in both directions. According to the Multiple Building manual, it was possible to add an endless number of modules in increments of 61'-6" in one direction and 100' in the other. 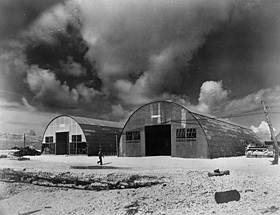 The largest assemblage of wartime Multiple Buildings was said to have been a 54,000-square-foot warehouse in Guam nicknamed the "Multiple Mae West." In the years following World War II, National Steel Products exceeded this by constructing their Houston headquarters from an assemblage of units covering more than five full acres.